The future is possibly brighter than expected! Let’s hope this new platform is flashlight and DIY friendly..
Not a lot of real info seems mostly marketing talk now. Small bright LEDs , easy to reflow and combine is what I take from it. But because it seems geared at combining to make street lights and such idk how much flashlight use they’ll have. Let’s wait what type of leds this leads to. I’m pretty optimistic about the story, the technology sounds really good and has the potential of very small die leds with high output like we want for flashlight use! I think The Miller is right. This marketing poster doesn’t give much info. And it doesn’t seem to be much of a revolution in LED tech – more like evolution along the lines of where Cree was already (seemingly) going. But, as djozz said, if it results in smaller, more lumen-dense emitters, it may still be a move in the right direction for flashlight use as well. We’ll just have to wait and see. I hope they get that first one out (for a reasonable price) pretty soon, so somebody here can test it and dispel some of the mystery! Interesting. It reminds me of the Nichia E21A and E17A’s compact package design and ability to be placed close together. 264 lumens/mm^2 isn’t that high if the die area is being considered, but is much higher when instead the package area is being considered, which is probably the case here. Hopefully the die will extend to the edge of the package and can handle a lot of current. This would enable us make large area high surface brightness “single die” emitters, like the XHP35, but as big as we want. Another 4 die LED. Extreme density. 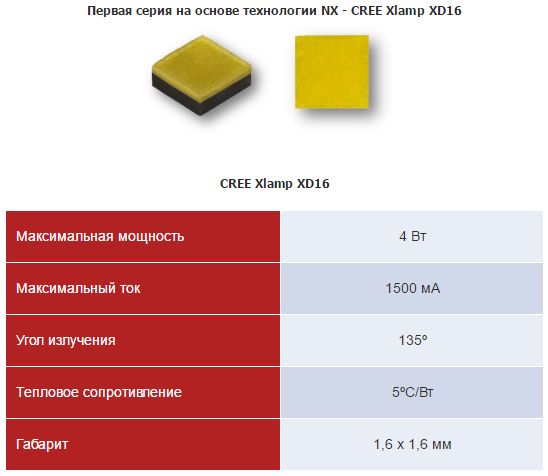 Cree did not provide many details about the first XD16 LED due on the market. We presume that the 16 refers to a package measuring 1.6×1.6 mm. 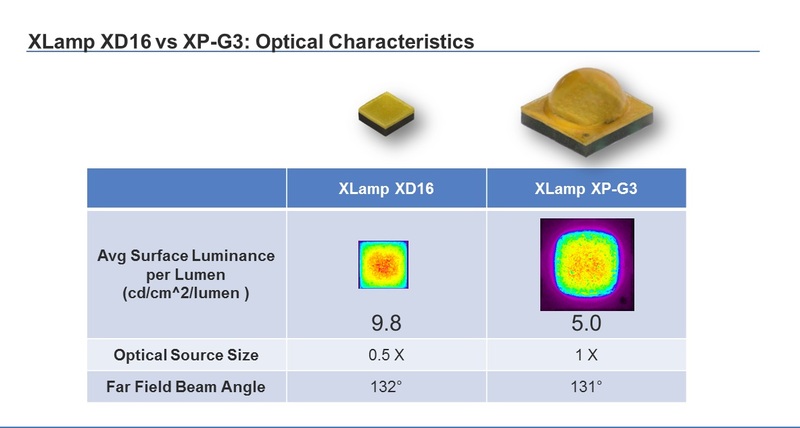 In the current Cree portfolio, the XD16 might be considered in the same class as the XQ-E LEDs. White XQ-E products top out at around 334 lm. 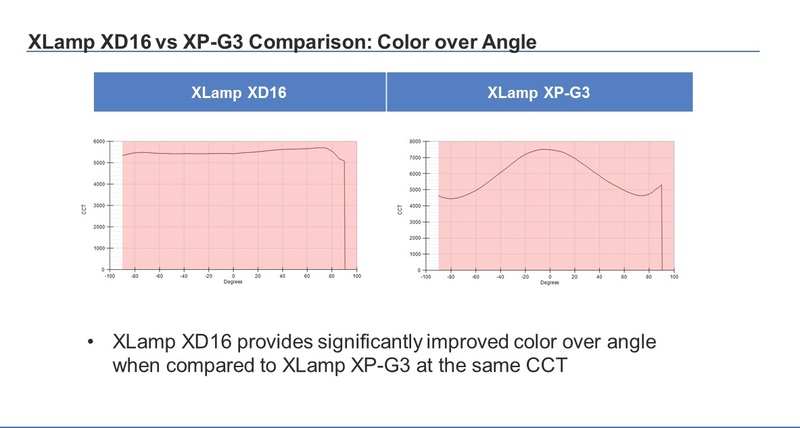 Based on the stated lumen density levels, the new XD16 LEDs might hit the 800-lm level. What may be interesting is if these can be tightly packed and allow us to customize 1×1, 2×2, 3×3, etc die sets all in parallel if we so choose.. assuming 800 lumens/emitter then we could have ~7000 lumens out of a ~XM footprint at 3V and domeless?? Just speculating.. We’re allowed to dream right??? Interesting, the question is does the die extend to the edge or is it only part way like the 144a? Too bad, not sure they will prove very useful for flashlights like that, much like the 144A. More like the E17A and E21A actually. Even if there is a bit of a gap, putting nine of them together would get one of them dead center in the array. 3×3, 5×5, 7×7, 9×9, and so on, all have a central led. Knock off the corners for more rounded profiles. The larger the array the more “round” it can be. lol, brain fart, those are what I was thinking of. I agree with this but they are only rated at what, 200 lumens each? a 9×9 grid would match an xhp35 for rated output. I am not sure that they will offer anything over existing high output LED’s personally other then possibly the ability to run them at 3V. Came across this picture somewhere: !http://www.insight.com.mx/contenido/daaf2c754_news_noticia.png! @TA I do believe they’ll be way more than 200 lumens (XD16 anyway). My estimations are about 600-700 CREE rated and roughly 800-900 BLF rated. That means that a 3×3 array would be around 7000 lumens. I’m thinking throw potential rivalling and XHP35 HI with “expandable” lumens and hotspot. A 9×9 grid would have 81 dies, far exceeding the output of existing single high power packages. If these have the good output usual with cree dies they could really offer new flexible ways to get a lot of lumens in a small area. It will be interesting to see what the beam looks like with an odd number array. As mentioned above the beam center should have good intensity unlike the current 4 die arrays. But the rest of the beam would still have lower intensity resulting from the averaging of luminance from the dies and gaps between the dies. I don’t like that they seem to have the two-pad footprint so the usual DTP-board mounting does not work. Hey guys. I’m not as knowledgeable as a lot of the others on this forum, but AFAIK, if you make an array of these in an odd-numbered configuration, only the one emitter in the center will contribute to throw. In other words, whether you have 1, 9, 25, 81, etc. of these, you will have the same amount of throw. As far as the LED is concerned, throw only depends on the brightness at the center of the focal point. There’s only one focal point, so adding more LED’s won’t change the amount of throw. lol, yeah I totally messed that up. I was thinking 9 total dies when doing the math and it must have slipped into the post. If they are rated for 600 lumens then that is another story. The only thing I saw was something like 200 lumens each die. Like djozz said, without the thermal pad I am worried that they will not see the overdriven benefits we see in other LED’s. Much like the E21A or any LED that is not used with a DTP MCPCB. I would love to be proven wrong though, a 3×3 with 6000 luemns is nice but would be basically the same as the XHP70.2 in a performance aspect. The key difference would be the ability to run it at 3V, which would be nice. Although with boost driver tech improving this is less important then it used to be. Overall I would say I am firmly neutral on these at this point. Simply not enough hard data to make any conclusions. It could go either way equally IMHO. This type of problem really drives me crazy. There must be a simple solution to this. I’m thinking for a 3V/parallel application there’s a fairly simple fix to get DTP performance. Series array applications would get complex/practically impossible. But if we used Aluminum “DTP” boards where one of the pads was “DTP” and then the base was anodized we may see decent results. You could then use a typical copper overpour as a heat spreader for the other pad. wait.. this makes me wonder. How do they make the Al to solder junction on regular Al DTP boards?? You could make a DTP pcb for one of the pads on these LED’s with some driver tweaks to apply either the ground or V+ through the flashlight body. They would need custom drivers though and as we learned with the E21A, only making one of the pads DTP doesn’t help all that much. Even with both pads DTP with the E21A clemence found very little to be gained by over driving them. I see no reason to expect much difference with the cree version. Was this data/experimentation posted somewhere? I didn’t see this. That’s a bummer then. I agree that the two platforms are likely going to share the same issues. Here’s for hoping they go up to at least an XB footprint then. XD25 anyone? The other thing that has me wondering is they claim to have improved the alignment properties while soldering so could they have done something wild with the solder pad geometry to cause this? I found the thread you are referring to! It’s funny to see that clemence had the same thought – 4 months earlier haha I’ll shut up now. 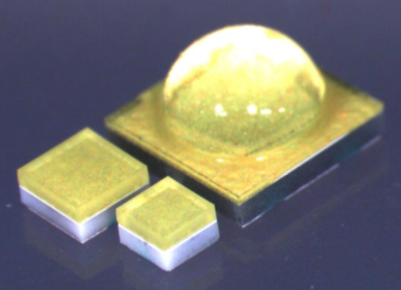 Also, I see now that Nichia used an interesting solder pad geometry themselves..
Found this data today.. By the looks of it we should see tint shift be nearly eliminated and surface brightness that rivals or beats all previous CREE products. That last part is highly dependent on how underdriven the specs are relative to previous generations of LEDs. The trend seems to be that they are getting more aggressive with max ratings, leaving less room for improvement when BLF-ing them. It also says: neutral thermal pad: no. So I assume a two-pad footprint. Makes BLFing much less succesful too. 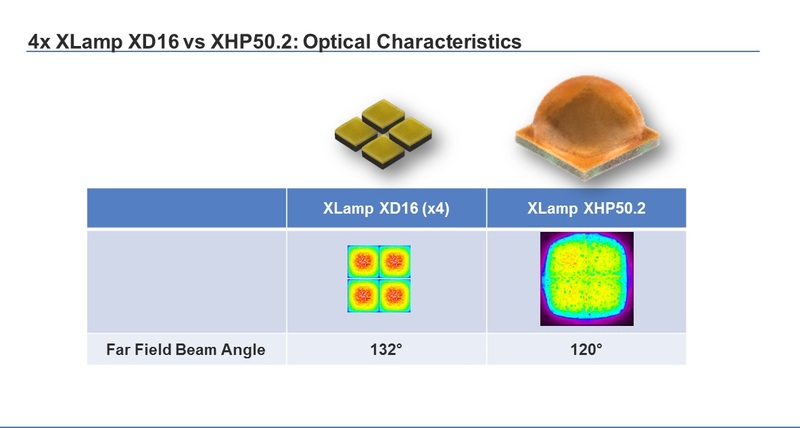 Just because the individual dies have a higher surface brightness the total package has a higher surface brightness compared to the xhp50.2. BTW should make an interesting mcpcb design to put the LEDs so close to each other. I think these would be better in multi-emitter optics than as arrays. Masters of neither throw nor output, but a good combination of both. These would hopefully enable better throw, much better cd/W than XP-G2 while having only slightly lower output. And hopefully slightly better lm/W too, though probably not. It would throw slightly less than a quad array with a single optic of the same diameter, but be smaller and (am I right here?) put more lm in the hotspot.